On a sheet of paper, answer the following questions. Write your answer AND the name of the website where you found your answer. Answer in complete sentences. 1. Where was Walter Dean Myers born? 2. What does Walter Dean Myers consider to be strange about his life? 3. Where was Walter Dean Myers raised? 4. Was Walter Dean Myers raised by his parents? Was he raised in a loving family? 5. What was Walter Dean Myers' passion when he was younger? 6. Who encouraged Walter Dean Myers to continue writing? 7. 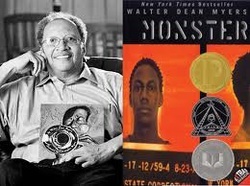 Other than Monster, what are the titles of three other books written by Walter Dean Myers? 8. Aside from realistic fiction, what is another genre Walter Dean Myers has written? 9. What is the name of the famous historical figure associated with the Civil Rights Movement whose biography was written by Walter Dean Myers? 10. What are two questions you would like to ask Walter Dean Myers if you were given the opportunity?